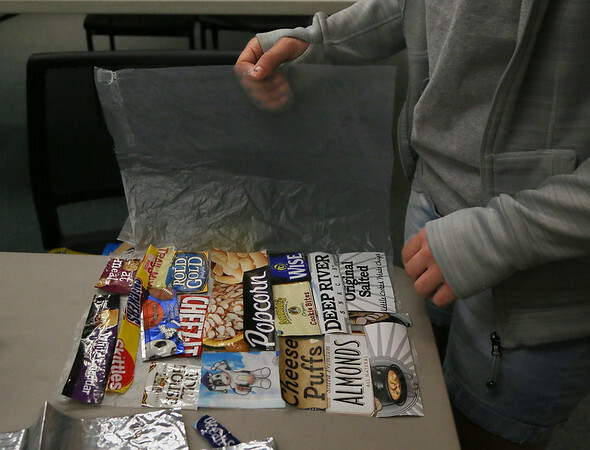 Kelsey Francis, 13, arranges logos from non-recyclable plastic food wrappers into a collage on top of material from the inner bag of a cereal box during the "upcycling" workshop. Afterward she used a hot iron to fuse the materials together for use in making a carrying bag. The workshop, taught by Lou Leelyn of Wendell, was designed to raise awareness of the huge volume of trash that people generate, and to get students thinking about creative ways to re-use things. Her philosophy: If you can't recycle, upcycle.